I was saddened to wake up this morning and read that My Chemical Romance have seemingly brought their band career to an end. After four studio albums, two sell-out world tours and 12 years of unconventional punk holiness, I think that it came as a shock to all when they left a small post on their official website, http://www.mychemicalromance.com/news/, claiming that "now, like all great things, it has come time for it to end". 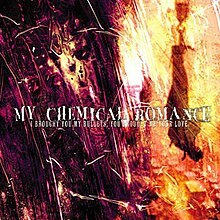 However, despite the sad news, I have decided to take it upon myself to review My Chemical Romance's debut studio album in the honour of Mikey Way, Ray Toro, the undeniably personable Frank Iero, and of course, His Royal Highness, Gerard Way. Following the horrendous attacks on the World Trade Centre on 11th September 2001, a witness drastically changed his life for good. He decided to form a band with his younger brother and close friend to express his feelings of depression and his general loss of faith in humanity. This man was Gerard Way. Way wrote the song "Skylines and Turnstiles" in remembrance of the 9/11 attacks, and shortly after he recruited Ray Toro to the band due to the fact that he wasn't able to sing and play the guitar simultaneously, and therefore needed somebody to play alongside him. Way's brother, Mikey, suggested the band name after being struck by Irvine Welsh's novel, "Ecstacy: Three Tales of Chemical Romance", and soon after joined the band after hearing their first demo tape. Frank Iero become the fourth member of the band in 2002, shortly before the recording of I Brought You Bullets..., following the split of his former band Pencey Prep. The album was released 3 months afterwards through Eyeball Records, and although they had been given no outside promotion or support, they gained an impressive initial fan base through social networking sites such MySpace. The album itself was an undoubtedly great debut effort, as the punk/metal sounds had been blended together so carefully and smoothly that they can only be described as an orgasmic rock purée. The lyrics are meaningful and anti-generic, and the emotions that come through are truly overwhelming in some parts of the album, especially in songs such "Skylines and Turnstiles" and "Vampires Will Never Hurt You" where the catchy lyrical patterns and heavy guitar riffs instantly mold themselves into your brain. The one thing that I particularly love about I Brought You Bullets... is that you can't really compare it to another one of it's kind (apart from some of The Misfits earlier album, maybe), and the running story line throughout the whole album really shows that Way had profound knowledge of what makes a good alternative-rock band from a very early stage in his career; he was destined to be famous. Whilst I was searching through the interwebs for a cheap physical copy of the album I stumbled upon a few reviews of I Brought You Bullets, You Brought Me Your Love, and after reading a few of them, I found this gem of a quote from a review that had been written on a small website in 2002. "Now, after all is said and done, it's obvious this band shows a lot of promise. But the sad truth is that you probably won't get a chance to hear them, considering their album is probably available in .01% of stores throughout the country and isn't even available to order online." This quote made me realise that it's not only myself that appreciates the work that various people have put in to My Chemical Romance, so on behalf of music lovers worldwide, thank you Reprise Records/Eyeball Records for making this small alternative-rock band from New Jersey the band that they are today.